Years adding up to #11 are represented by Strength. 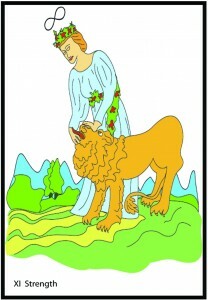 This is a year of fiery energy yet one where you’ll learn to direct your inner wildness to foster your personal power. Balancing this inner beast with innocence and compassionate wisdom will help you towards your goals. In the Strength year you discover the ability to live with passion while remaining mentally at peace. Courage and integrity are gifts of this year. When you focus and stay true to your inner wisdom you can ride any flame. This is a year where there’s more power in the gentle touch than in forcing an issue with rage and impetuosity. The Strength year encourages a lust for life and a loving appreciation for its eternal cycles. The shadow symbols for Strength are Judgment and the High Priestess.